Courses with a “natural history” designation are generally absent from contemporary college catalogs, yet many larger cities throughout the world host museums of natural history, often tracing their founding to the nineteenth century. During this time, scientific study became more specialized and experimental, researchers were professionally trained and no longer talented amateur gentlemen, and the boundaries of natural history became more restricted than in Pliny the Elder’s monumental work of the same name published in the year 77. The influence of Pliny the Elder—a Roman lawyer, army and navy commander, and naturalist—was considered perhaps second only to Aristotle. The thirty-seven books that comprise Pliny’s Natural History were intended to encompass all known information about the natural world and were based on the writings of the most distinguished authorities. Pliny assembled zoological data from Aristotle and plant-related material from Theophrastus. Books were also devoted to astronomy, geography, geology, mineralogy, and agriculture. Pliny’s work, with its broad scope of subject material assembled in a systematic manner, specific references to the hundreds of original sources and authors consulted, and an index of its contents, served as the prototype for subsequent encyclopedias. Although the work mixed fact with fiction, folklore, magic, and superstition, it remained the unchallenged source of natural history until the end of the fifteenth century. Far more accurate and limited in scope to the animal and mineral kingdoms was the thirty-six–volume Histoire naturalle, written from 1749 to 1788 by the French naturalist Georges-Louis Leclerc, Comte de Buffon. Studies of nature were subdivided during the nineteenth century, and classified as either natural philosophy, which included physics and astronomy, and natural history, including biology (zoology and botany) and the geological sciences. Today, there is no universally accepted definition of natural history, but it generally refers to the study of plants and animals in their natural environment and emphasizes observation and description rather than experimentation. SEE ALSO: Aristotle’s The History of Animals (330 BCE), Botany (c. 320 BCE). 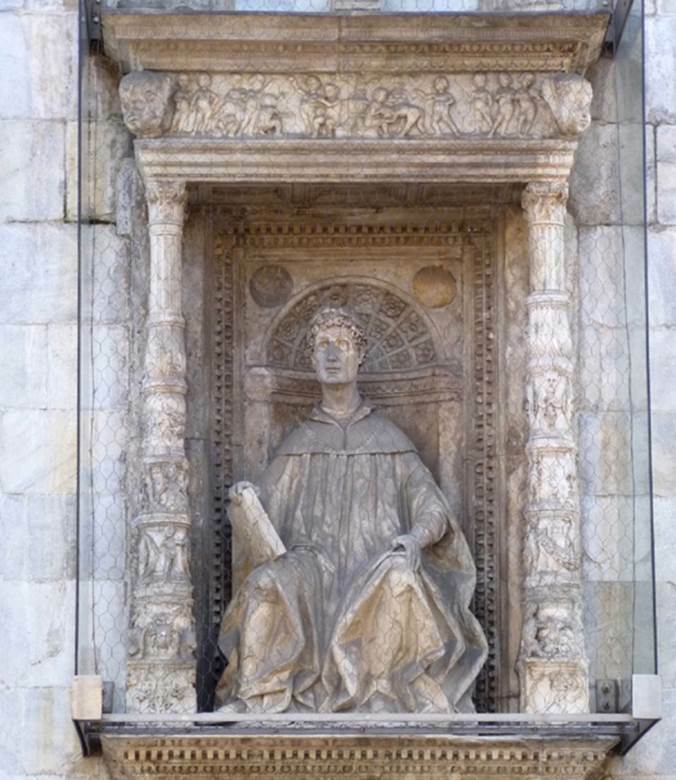 This statue of Pliny the Elder (Gaius Plinius Secundus) is on the façade of the Duomo cathedral of Como, the Italian city of his birth.